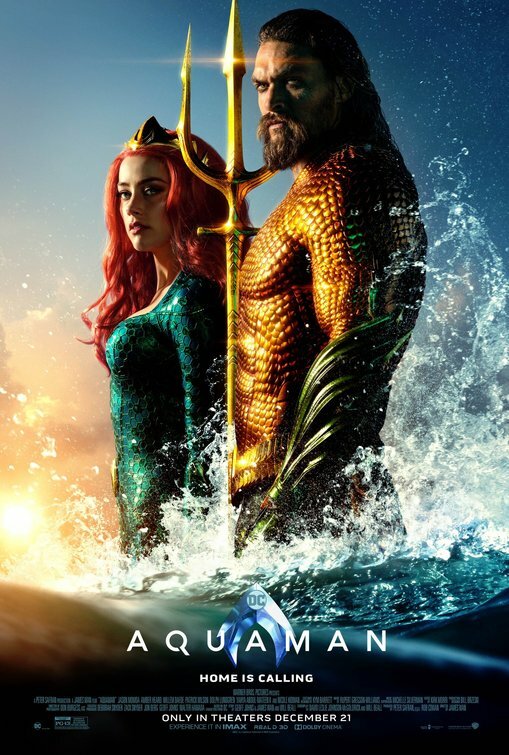 Synopsis: Arthur Curry learns that he is the heir to the underwater kingdom of Atlantis, and must step forward to lead his people and be a hero to the world. Review: In some ways, you have to have a little sympathy for the folks running the show over at DC Studios/Warner Brothers. Despite a strong run with their original Batman franchise and then Christopher Nolan’s The Dark Knight Trilogy, they’ve struggled mightily with finding their footing in future films. Man of Steel was a complex origin story that was ultimately too cool to the touch, Batman v Superman: Dawn of Justice was savaged by critics even though it wasn’t nearly as bad as everyone remembers it to be, and Suicide Squad was just outright garbage. Then a minor miracle happened in the excellent Wonder Woman and it seemed like the beleaguered studio had learned their lesson and turned a corner…only to have those hopes dashed a few months later with the release of the box office turd Justice League. Well, it’s been a year and another DC stand-alone superhero movie has come swimming along in the hopes it can make some waves in what has up until now been a fairly shallow pond. While Aquaman has its regrettable missteps and its fair share of groan-worthy dialogue, it’s not enough to sink it to the bottom of the DC ocean thanks to a director that brings a unique style and an eclectic cast willing to go the distance for some overly fishy material. Though we’ve met Arthur Curry/Aquaman (Jason Momoa) briefly in BvS and Justice League, this is his first time taking center stage which means part of the film mandates that this is his origin story. When his father (Temuera Morrison) rescues a mysterious woman (Nicole Kidman, Stoker) from the sea, he doesn’t know she’s a sea princess from Atlantis on the run from an arranged marriage to a rival king. The two fall in love and have a son before Atlanna is forced to abandon her family and return to the sea in order to protect them. Flash forward twenty-some years and Atlanna’s son has grown into a man of rippling muscles and tribal tattoos that can communicate with sea creatures and swim faster than a speeding torpedo. He’s also invincible to most mortal weapons, as evidenced in an opening battle between pirates aboard a hijacked submarine. The events that take place here will create the genesis of Manta (Yahya Abdul-Mateen II, The Greatest Showman), an enemy for Aquaman who will haunt him throughout the film. Meanwhile, fathoms below the sea a plot is being hatched by Aquaman’s half-brother Orm (Patrick Wilson, The Nun) who seeks to become the all-powerful Ocean Master by joining forces with King Nereus (Dolph Lundgren, The Expendables 2) and dominating the underwater kingdoms by any means necessary. When Mera (Amber Heard, The Danish Girl), Nereus’s daughter gets wind of the plan she reaches out to Aquaman for his help in returning to Atlantis, defeating his brother, and claiming the throne that is rightfully his. After a lifetime of turning his back on the undersea nation he feels took his mother away from him, helping out his people isn’t high on Aquaman’s list of priorities. At 143 minutes and with multiple storylines to follow, Aquaman is certainly ambitious in his first time going it alone. Even if the script from David Leslie Johnson-McGoldrick and Will Beall doesn’t contain the same type of rousing origin story executed so well in Wonder Woman, there’s a nice flow to the first and third acts of the film. It’s the second act where Aquaman and Mera start to globe-trot in search of a lost trident and are pursued by Manta where things start to get a little choppy. I get why the Manta storyline was included (stay through the credits to find out why) but it just felt extraneous to everything else going on in the film. Chucking all that and focusing on the contained story about Aquman’s conflict with his brother would have been enough to fuel the movie just fine. Like Gal Gadot’s Wonder Woman, the movie succeeds largely on the screen magnetism of Momoa as Aquaman. While he relies too often on his hair and an over the shoulder glance to do most of the work for him, by the time he’s donned the famous orange and green Aquaman suit he had more than convinced me that he’s a born action star. Sadly, Heard is a bit of a dud as his leading lady as is Wilson who literally treads water for most of his scenes. There’s some unfortunate de-aging scenes with Morrison and especially Willem Dafoe (The Florida Project) as an emissary of Atlantis playing both sides which actually make both men look like they’re motion captured holograms instead of flesh and blood actors. Kidman is really the one that makes the biggest impression in her short amount of screen time. The Oscar winning actress is at the point in her career where she can take whatever role she wants and this one seems like it was a choice made out of pure moviemaking fun. She strikes the right tone and never falls prey (like many of her costars) to take things to a heightened sense of camp even during moments like when she has a goldfish tail sticking out of her mouth. Bringing in director James Wan (The Conjuring) was a smart move on the part of Warner Brothers. The director has a recognizable filmmaking calling card and it’s clear from the beginning of the movie that this picture is being overseen by a director interested in doing something different. Odd camera angles, carefully designed long-shots, and sequences that seem to jump over impossible obstacles in one smooth tracking shot are all Wan staples and they’re used to great effect here. Add to that some awesome visual effect work (see the film in 3D if possible…and I don’t say that lightly) and a retro-feeling synth-heavy score from Rupert Gregson-Williams (Blended) and you get a DC picture that actively tries to separate itself from the pack. Even if it doesn’t always work, it at least fails while trying hard and not by comparison to the films that came before it. Now that this first Aquaman film is out of the way and with no other Justice League movies in the pipeline, I’m hoping that DC/Warner Brothers gets to work on a sequel and quickly. Feel free to take your time like Wonder Woman 1984 (due in 2020) is doing but now that Wan and company have established the world of Arthur Curry/Aquaman, they have a whole ocean of possibilities on where to take the next chapter. Review: As a child, every few weeks my parents and I would travel 115 miles south to visit my mom’s family. Getting up early and missing Saturday morning cartoons wasn’t that big of a deal to me…it was the Sunday return trip that caused great anxiety in our car. You see, Sunday afternoon at 4pm is when reruns of Wonder Woman were on. Capping off a block of programming that included The Six Million Dollar Man followed by The Bionic Woman, Wonder Woman was Must See TV for this fella and my parents came to the understanding that come hell or high water, we had to be home by four. Now, several times this didn’t happen and let’s say…things got messy. That context is helpful to you, dear reader, in understanding why this long planned big screen adaptation of Wonder Woman was more than just another anticipated summer blockbuster for me. This was the arrival of a character I truly grew up with, maybe more so than Batman or my ultimate favorite, Superman. I came to Wonder Woman via the Lynda Carter television show and not like many did by way of DC Comics. Created by William Moulton Marston, the Amazonian Princess first appeared in 1941 and quickly became a popular symbol not only of strength but of a woman with the ideals to be a natural leader of all. A reboot of the TV show was attempted but failed at the pilot stage several years back and while Wonder Woman was hinted at being a part of the planned Warner Brothers DC Universe at some point, it wasn’t until the character was a surprise addition to 2016’s Batman vs Superman: Dawn of Justice that fans finally saw the light at the end of a long dark tunnel. While many (including me) had their own issues with BvS, most agreed that Gal Gadot’s Wonder Woman was a memorable highlight of that film and looked forward to the stand-alone movie that would be released before Justice League later in 2017. Then the deplorable Suicide Squad was released late summer 2016 and people began to worry that Wonder Woman’s bright beacon of hope would be unfashionably oppressed by DC Universe’s strangely dark style. 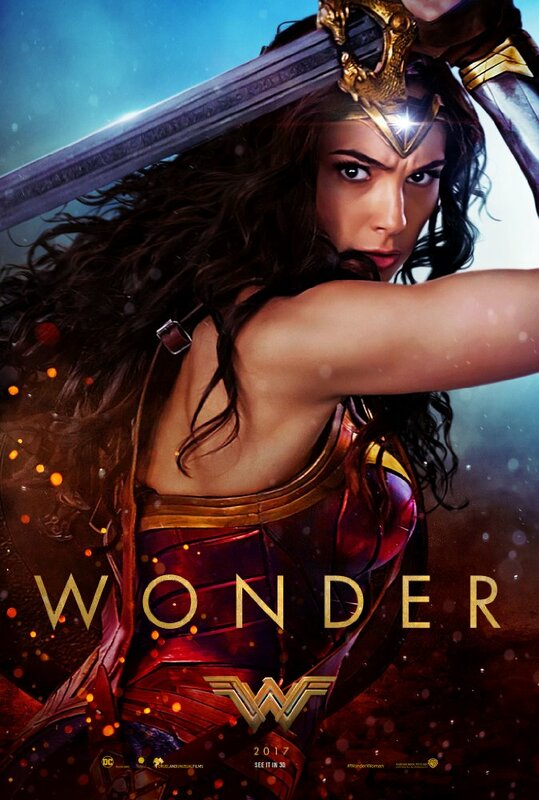 Fear not, though, because not only does Wonder Woman make a most excellent showing in her first solo big-screen adventure, but it’s by far the best comic book adaptation in almost a decade. Besting the best of the boys club that came before her, this heroine has brains and brawn in addition to her beauty. It’s more entertaining than you can possibly imagine and would make even the hardest non-fan of comic book movies buckle in their resolve. 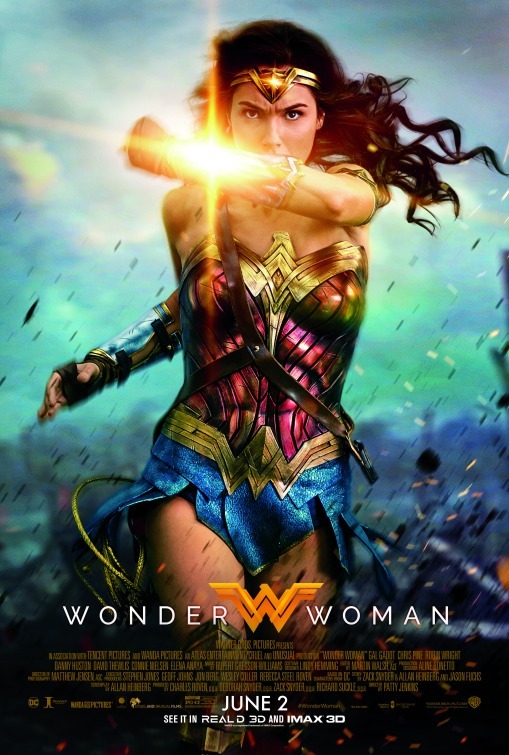 While longtime fans may be bug-eyed that the screenplay by Allen Heinberg from a story by Zac Snyder, Heinberg, and Jason Fuchs moves the action from WWII to WWI, it plays into the overall success of the picture by showing Wonder Woman’s superhero emerge at the same moment that war-time weapons took a strikingly modern leap forward. Why wouldn’t a solider be just as amazed at a woman deflecting bullets as they would be by the automatic machine gun that’s firing them at her? Wonder Woman is a classic origin story that manages to breeze quickly through the lore while satisfyingly hitting all the right notes at the same time. Living among the Amazon women on Themyscira (Paradise Island), young Princess Diana is a force of nature ready to learn to fight but kept at bay by her overprotective mother (Connie Nielsen, Gladiator). Secretly trained by her aunt (Robin Wright, Everest, buff as hell) over the ensuing years, her skills are put to good use when a plane carrying U.S. spy Steve Trevor (Chris Pine, Into the Woods) crash lands in the sky blue waters off the coast. Soon, Diana is accompanying Steve back to jolly old England (“This place is hideous”, exclaims Diana upon seeing the gloomy London harbor) and embarking on a quest to stop a crazed General (Danny Huston, Big Eyes) and his evil scientist comrade (Elena Anaya, The Skin I Live In, frightening in a Phantom of the Opera-esque ceramic mask) from releasing a chemical weapon onto their enemies. Proving that maybe more females should be in charge of high caliber action films, director Patty Jenkins should be lauded for crafting one of the best entries in recent memory. Not only does she stage her battle scenes with grand flare but she manages to never over sexualize her star as I fear her male colleagues would have. There’s no gratuitous shots looking up at Wonder Woman (and up her skirt in the process), no scenes framed with her cleavage taking center stage, no temptation to give fanboys an opportunity to linger too long on the exposed skin. Instead, she presents Wonder Woman and all of the characters (male and female) as equals in the eyes of the camera. In fact, the most skin on display here is from Pine as he emerges from a healing spring on Themyscira, providing for some fun dialogue between Diana and Steve. Gadot (Keeping Up with the Joneses) was a star on the rise going into this film but she firmly cements her justified ascent with a fully layered flesh and blood performance. Her delightful naiveté when entering the modern world reminded me of Daryl Hannah’s fish out of water exuberance as a mermaid on dry land in 1984’s Splash. We’ve seen this stranger in a strange land done before but never with such charm. As she grows to see that humans are deeply flawed, Gadot admirably portrays the disappointment of someone learning the truth after realizing they had believed too long in fiction. Though he already has a strong foothold in the Star Trek franchise, Pine turns in one of his best performances as the American solider striving to do what’s best for his country. Pine and Gadot have excellent chemistry and when the inevitable sparks begin to fly, it turns into a courtship during combat that feels well earned. As for the bad guys and gals, Huston is his typical smarmy villain while Anaya memorably makes for a more interesting foe to our heroes. The film has a lot packed into its 141 minute run-time but never feels long or taxing. Yes, the last half hour delves into the kind of special effects heavy finale that tends to assist my eyes in glazing over at double speed but so much was excellent up until then that Wonder Woman’s battle royale (with an enemy revealed in a nice twist) managed to hold me at the edge of my seat. While there’s no post-credit scene, the film doesn’t need one because the correct edges have been rounded off and just the right amount of loose ends remain for future installments to easily pick up and run with. Some say that summer blockbusters begin in May but for me the summer has truly begun in June with Wonder Woman’s much appreciated arrival. There’s no regret to be had for seeing this one in the biggest theater possible with a packed audience. Enjoy! Synopsis: An Amazonian princess leaves her island home to explore the world and, in doing so, becomes one of the world’s greatest heroes. Thoughts: Wonder Woman’s journey to the big screen has taken a looooooooooooong time. The popular female superhero has had life on the small screen but hasn’t used her lasso of truth to snag a major motion picture until now. While many audiences and critics reviled Batman v. Superman: Dawn of Justice (not me, I thought it was great), the one consensus was that Gal Gadot’s Wonder Woman was the highlight of that film. Gadot (Keeping Up with the Joneses) made good use of her brief screen time and boy does this new trailer for her origin pic look like a winner. Directed by Patty Jenkins and co-starring Chris Pine (People Like Us), June 2017 seems so far away…but it seems like the wait will be worth it. Fingers crossed.